After having to cancel the AirMed Bicycle Group Ride on Saturday, May 14, 2011, because of rain and cold, I was more than ready to get out for a long ride. Fortunately on Sunday the weather cleared and temperatures reached 17 C but with some pretty heavy wind from the northwest. I had heard about all the nice paved trails in Minnesota so I ventured over to Houston, Minnesota, which is only 20 minutes driving time from downtown La Crosse, Wisconsin. My thought was that with the bluffs and woods I would be protected from the wind and for the most part I was right. My plan was to go long but I only had the afternoon and by the time I got everything together and drove over to Houston it was after 13:30 CDT. So I figured I would go 100K and just turn around at the 50K point. I was pleasantly surprised that in exactly 50K from Houston I would arrive in Lanesboro, Minnesota, which is the headquarters of the trail and bills itself as the Bed and Breakfast Capital of Minnesota. The picture to the left and the one below are just a few of the many bridges along the way. 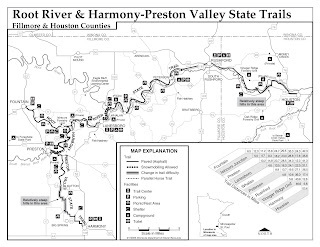 This map and plenty of information about the trail can be downloaded at the Root River and Harmony-Preston Valley State Trails website. 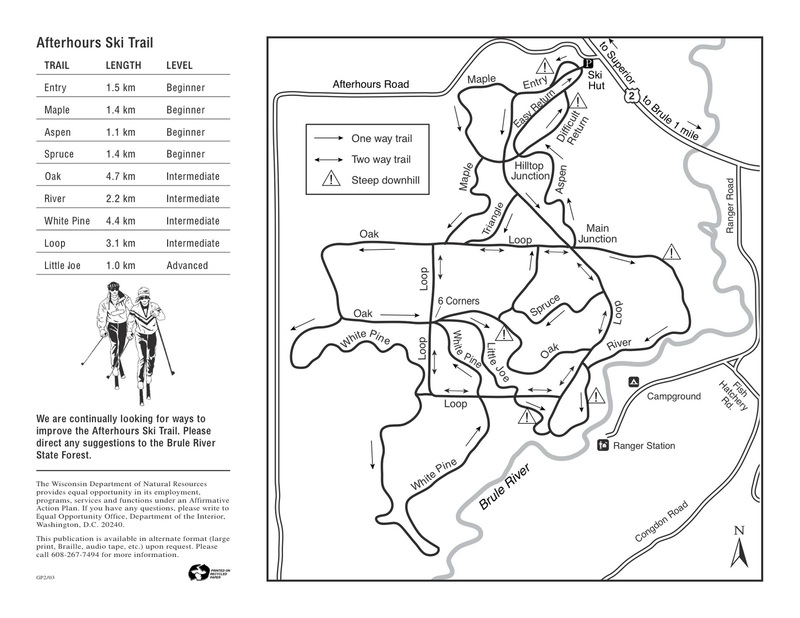 I printed out a copy which was nice to have but not a necessity as the trail is well marked and is 100% paved so all kinds of bicycles can easily navigate it. In the section of the trail I did there was only one small hill that was about a 5% grade, so a good ride for all levels of cyclists. On this particular day there seemed to be more families and recreational riders near Lanesboro as they have a large shop that rents cycles. I am sure in the summer the trail could be quite busy. 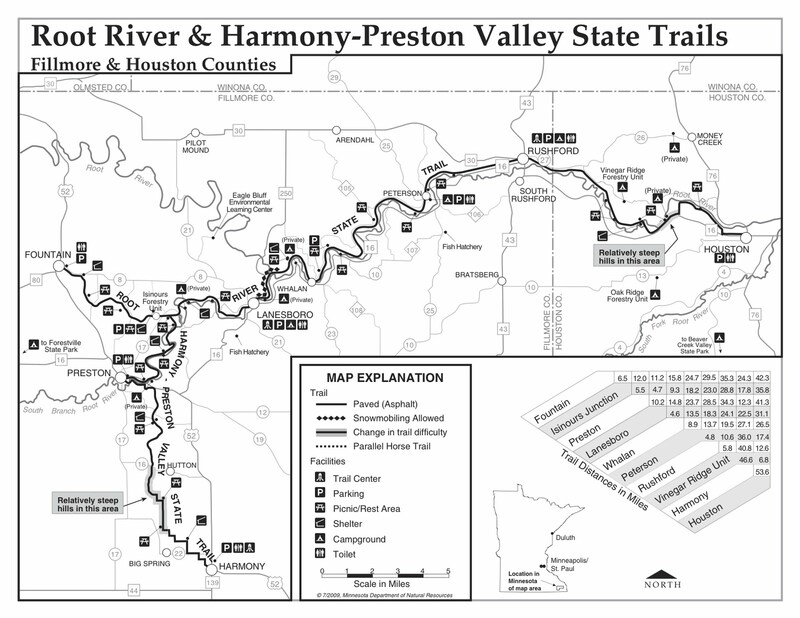 The Root River Trail, which is part of the larger Harmony-Preston Valley State Trails, follow old railroad tracks along the Root River and is nestled among very scenic bluffs with plenty of SAG stops in the small towns along the way. The trail passes through Rushford, Peterson, and Whalan before I turned around in Lanesboro. The picture to the left is from Rushford. The total time I was out was four hours and 50 minutes and riding time was four hours and 10 minutes. The main SAG stop I took was in Lanesboro where I found a nice park bench and relaxed in the sun after briefly walking around this very quaint town. My picture below was taken by a cyclist I ran into who was also out getting some good distance cycling in. He told me that the Harmony-Preston Trail was also very scenic and included a few more hills especially on the way to Harmony, Minnesota. The stats from my Garmin can be seen below. My average speed was 24 KPH for the just over 100K ride and because of the flat nature I was spinning the whole time. Unfortunately, my cadence meter battery was out as I would have been interested in the reading. Next time! 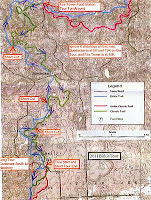 This trail will be a very nice route for a future AirMed Bicycling Group ride so I have added it on our VeloCal.org site. I know I may be in the minority of my friends but I love winter. This year I had the opportunity to experience Nordic skiing and snowshoeing for four months from December through March and I am very thankful. 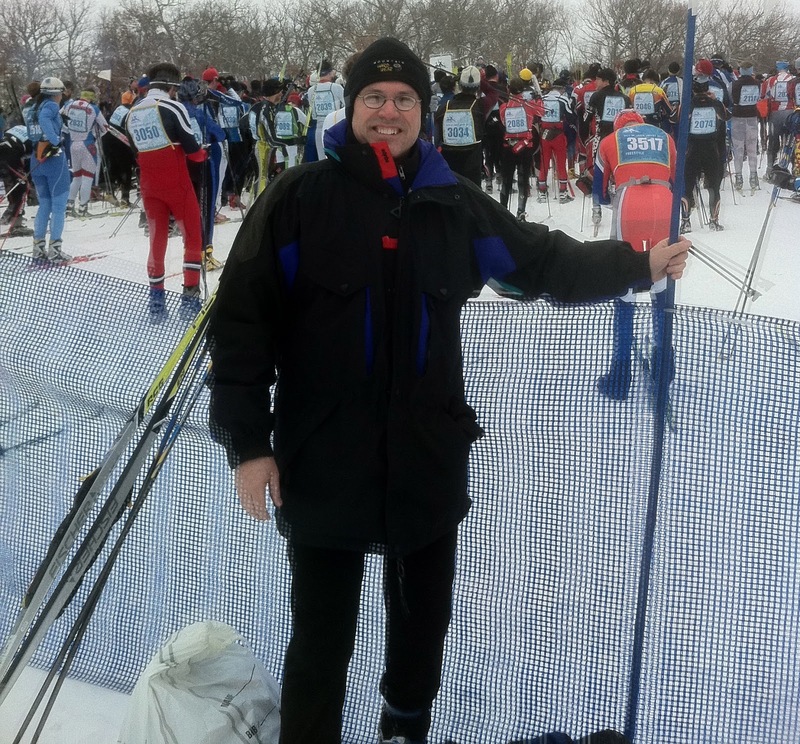 I also participated in five events including The Fridtjof Nansen Ski Race, the BirkieTour II, the St. Mary's 10K, the City of Lakes Loppet, the American Birkebeiner Nordic Ski Race. See write ups of each on this blog. 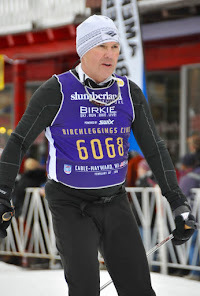 It was a challenging year with both the Birkie Tour and Birkie 52K being extremely cold. I only went snowshoeing one day this winter but it was with my bride on my birthday - so February 12th was a magical day. Carol was up in La Crosse for a long weekend and we spent Saturday afternoon hiking some of the upper Hixon Forest Trails before going out for a nice dinner at The Waterfront Restaurant and Tavern which is right on the Mississippi River. We also had a wonderful MedLink AIR staff party at the Train Station BBQ on Friday night where it was a great opportunity to introduce Carol to fellow co-workers and for me to meet their spouses and significant others. After the Birkie I was able to ski two more weekends. 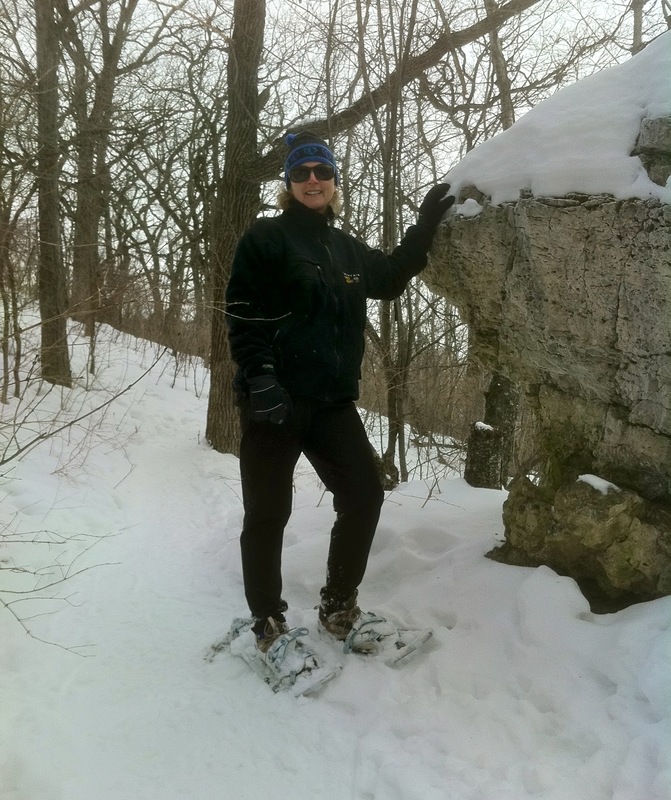 On Sunday, March 6th I skied the trails at St. Mary's in the early afternoon after church. The picture to the left was taken after a long climb up from the parking lot. The weather was beautiful with a nice sunny day, temperatures at -1C, a bit of a south wind, and trails that had been freshly groomed the day before! I skied 13.39K and had an absolutely delightful time including a nice talk with one of the Brothers who teaches at St. Mary's University. Fast forward one weekend to Saturday, March 12th and I was in Northern Wisconsin and Tim Burke and I got in our last ski of the season in the Brule River State Forest on the Afterhours Ski Trail. The area has a number of trails that are mostly flat but very well maintained by the park service and the Brule XC Ski. We lucked out because when I drove up to Superior, Wisconsin where Tim and his wife, Val live on Friday night we were not sure if we would get to ski since it has warmed up. We lucked out, however, and had a nice day of classic skiing with four inches of new snow followed by a cool down with temperatures at -6C. The picture to the left shows all the fresh snow both on the trail and in the trees. The first picture in this post is of Tim and I on the Afterhours ski trail. 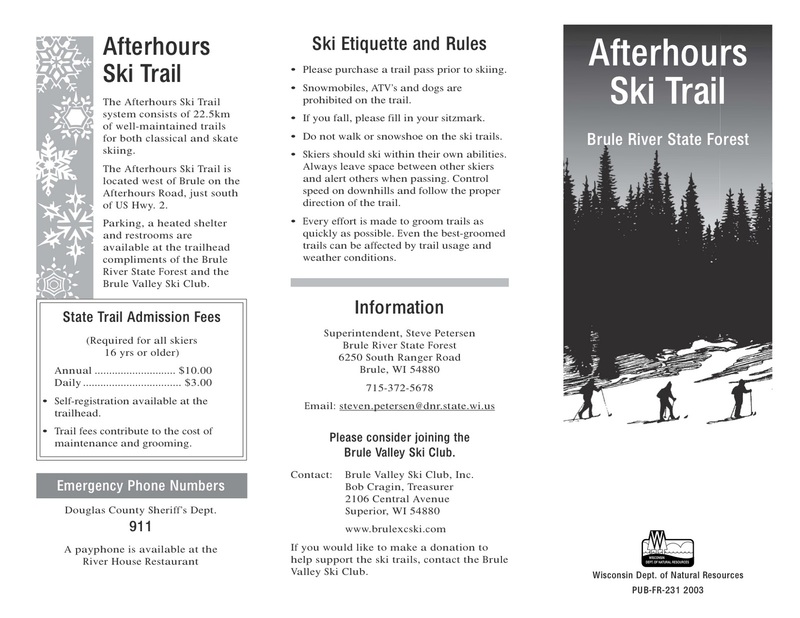 The picture to the left you will find near the parking lot at the Brule River State Forest on the Afterhours Ski Trail. I would highly recommend this area as a Daily Trail Pass is only $2 and if you have a yearly Wisconsin State Park Pass for $20 you are also covered. 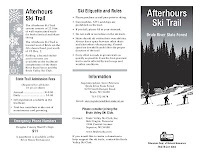 Below is the brochure from the Afterhours Ski Trail which shows the trail map. I am writing this post on the first day that I rode my bicycle this season, Saturday, March 19th. It was only a short 14.66K ride on a nice sunny day with temperatures at 15C. As you can see from the picture to the left, we still have a good bit of snow here in La Crosse, especially in the bluffs on both sides of the Mississippi River. This picture was taken on Bliss Road which goes up to Grandad Bluff Park that overlooks the city. I thought this was a good picture to show the transition today from skiing to biking. Snow in the background and on my bike in the foreground. Thank you Winter and hello Spring! My Garmin Connect GPS from the two days of skiing and the short ride today are located below. 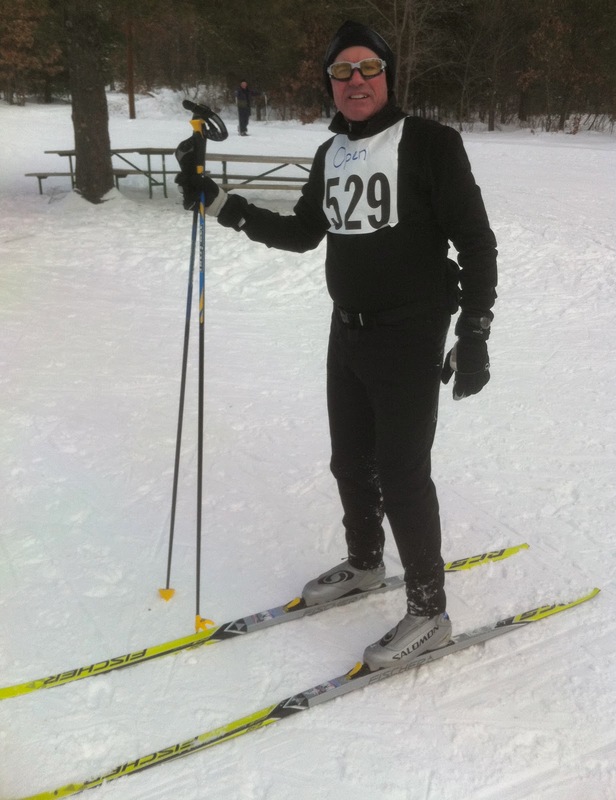 I participated in my 24th American Birkebeiner Nordic Ski Race on Saturday, February 26th. Tim Burke, Mike Tarnow, and I have been coming to the race for 26 years now with each of us missing a few races and then all of us in 2000 when the race was cancelled for the first time. 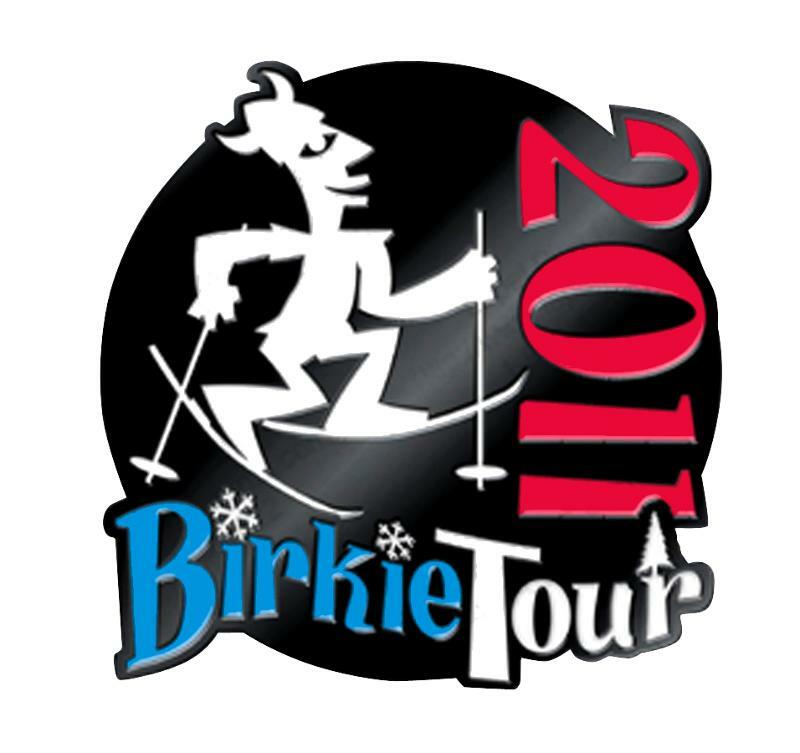 We have chronicled our time at the Birkie on our website at Birkie Web and now our Facebook page called Birkie Web Today. We have even done a few podcasts and had an article published in the Sawyer County Record on our Birkie Axioms as well as put up several photographs of this winter event that has been held for 38 years now. The picture to the left is of Princess Finnley (AKA Prince Haakon) who I met in the warming hut at Double OO in Seeley, Wisconsin after skiing in my traditional Wednesday 18K ski over the hilliest part of the course from the North Trail Head in Cable, Wisconsin. This year I had a nice fall on one of the steeper hills practicing weight shifting and balance. Of course my spin on the story, is that as a Birchlegger, I was protecting the Prince! This picture is of Tim, Mike, and I at the starting line tent. Mike skied in Wave 2 and Tim and I were in Wave 6. Mike has been as high as Wave 1 and Tim and I Wave 4. Tim and I have been coming to the Birkie since 1986 and Mike joined us three years later. We all met in Michigan and only Mike still lives in Traverse City. Tim is now in Superior, Wisconsin and I have lived and worked all over country and am now in La Crosse, Wisconsin. Mike was the only smart one with the moleskin as I ended up being pulled off to one of the First Aid Stations because of a nice case of frostbite on my nose. Tim fared better with his beard but it was fully ice covered at the end. None of our times were great but, as always, the Birkie is much more than just your time and rushing through one of the most beautiful trails in North America. 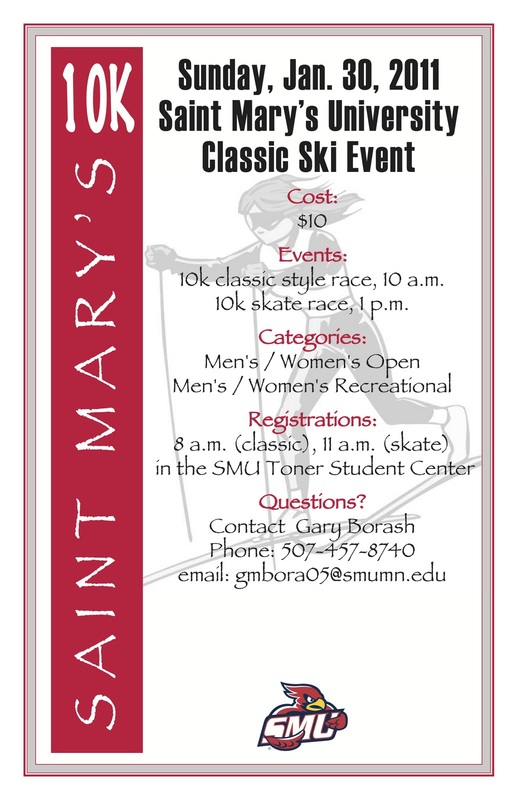 We come up to the Birkie for a week and this is the first year since I lived in Kalamazoo, Michigan where I was able to get plenty of snow time in with three other ski races / tours and then just going out skiing both here in La Crosse and at Saint Mary's University in Winona, Minnesota. We have stayed at a number of places including the Pilot Fish Inn for 14 years, a cabin on Lake Namakagon for 6 years, and this year in a larger cabin on Lower Clam Lake. We are further away from the start but with age we have come to appreciate additional amenities, such as more than one bathroom especially on race morning after all the carbo loading! Although even the Carbo Loading has become out of favor rather than just replenishing during the race. The picture is of the Cascade Cabin which sits on Lower Clam Lake at the mouth of the Clam River. Very soothing sounds of the water which are most likely even more pronounced in the summer. Another nice feature of our new cabin is that we have a full basement that has an unfinished area where we can wax our skis easily, a full-size game room with bar, and a washer and dryer. In this picture Tim is getting his skis ready for the Book Across the Bay race which is held the Saturday before the Birkie. The race starts in Ashland, Wisconsin at twilight and goes across the ice on the Chequamegon Bay to Washburn, Wisconsin lighted by luminaries. We did the race for the first time last year and had a great time as the conditions were really fast and it was not too cold. This year, however, we decided not to ski the race because with the big warm-up that happened the week before most of the snow had melted into the ice and even with the best the race crew could do, it seemed way to treacherous and risky and ripe for a nasty fall onto hard ice. Instead we spent some time touring around Ashland including The Music Center where Tim and I jammed respectively on the guitar and drums working out the Book Across The Bay Blues. We had a late lunch / early dinner at the Deep Water Grille and South Shore Brewery where they have great food and beer. We also were able to watch the start from an overlook and the size of the race was indeed much smaller than last year which was sad. We all agreed that conditions with this race can be tricky as it could also be very cold and windy too. All in all a very nice non-skiing afternoon, however. Mike did not have his best Birkie Week. First he had to travel back to Grand Rapids for a client who was in a federal bankruptcy hearing. Mike provided the real estate appraisal. Second, and most important, his mother has been in poor health and had worked on her own end of life plans, which Mike and his sister and brother fully agreed with. We thought he may not be back when he went back for business but he was able to fly back in to Minneapolis Thursday in the late afternoon so as to pick up his bib at the Hayward Middle School. Mike got the bad news Friday afternoon that she had peacefully passed. There were no Saturday flights, so what was probably best for Mike anyhow, he was able to ski the race. First thing Sunday morning we had to get him to the airport early so he could catch an earlier flight to Detroit though. After a nice Classic Nordic ski from the Fish Hatchery Trailhead and lunch in Hayward on Monday, Mike drove to the airport in Minneapolis. Tim and I decided to make a visit to the American Birkebeiner Ski Foundation office before heading back to Clam Lake. 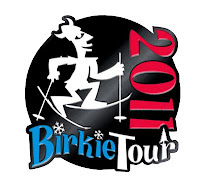 We had interviewed both Cherie Morgan and Ned Zuelsdorff in previous Birkie Web Today podcasts so Cherie arranged for a very nice impromptu tour of their offices before the onslaught of skiers later in the week. Both are delightful people that are totally dedicated to making the American Birkebeiner not only into the largest and most enjoyable Nordic Ski Event in the United States for skiers but in creating a world class winter festival with all kinds of expanded and new activities for everyone, including this year, both skijoring and Big Ski races. Pictured from left to right are Cherie, Tim, Ned, and Ed. On Tuesday, Mike had arranged for Tim and I to take a ski lesson from Steve Morales, who is the founder of the New Moon Ski Shop, Nordic ski instrutor, and Birkie Veteran. I think Mike was sick of pounding technique tips into us and knew that Steve would be much more patient. It was a delightful sunny afternoon skiing from the Mosquito Brook Trailhead and listening to and watching Steve. Both Tim and I were working on weight transfer and balance on downhills and general poling styles. In the picture to the left are Tim, Steve, John Bauer, and me. John is a three time US Olympic Team skier who happened to be skiing by when we were taking our lesson. On Wednesday it has become my tradition to ski from the North Trailhead in Cable to Double OO, which is about 18K over the hilliest part of the trail. Since I have lived mainly where there was not skiing it was even more important to have some snow time like this. As noted above I had fallen on one of the hills but continued on with a scraped up face. I ran into John Torinus, who after talking about skiing and retirement, informed me that he was the founder and chairman of the Serigraph Company in West Bend, Wisconsin which is north of Milwaukee. John has also authored a book titled The Company That Solved Health Care, which he told me about after finding out that I worked as the Director of the MedLink AIR Critical Care Transport program at Gundersen Lutheran Health System. He knows Dr. Jeff Thompson, our CEO. John is 72 and never wants to retire since he likes to be active both mentally and physically and if you are doing what you love, I would have to agree. He took this picture of me coming up a slight hill around the 16K marker. Since getting back to La Crosse I have ordered John's book and look forward to reading it. On Thursday the Elite Sprints are held on Main Street in Hayward. This picture shows a member of the Russian Team who had a large contingent of skiers at the race. The participating skiers go head to head in heats that go back and forth on Main. The skiers go all out as can be seen from the video below from the Sawyer County Record. Driving back on to Clam Lake we go through an Elk Protection Area and were lucky on Thursday to catch a small herd on the side of Wisconsin Route 77 south of Clam Lake. Beautiful animals and I found out from one of our pilots, Jake Jacobson at MedLink AIR, that the heard, that originated in the Rockies, numbers about 100 which is behind what the planners had wished for. Bears and Wolfs have been a problem that Elk further south in the United States have not had to experience, let alone the colder weather. On Friday I caught up with Prince Haakon (AKA Princess Finnley) again with her mom, Ann, in downtown hayward watching the skijoring and Big Ski events. She seemed to be enjoying her Norwegian Costume and hanging out with both her mom and grandmother, Gretchen Lingren, who is a Birkie skier that was playing Inga of Vartieg. For Race Day on Saturday we probably got over to the start a bit too early but we wanted to make sure we could get a parking space at the lot on the road to Telemark Lodge. Temperatures were very cold at -25C and not warming up much more than -15C. There was also a southwest wind that you felt sometimes in the open areas as the trail generally goes from northeast to southwest. Besides the frostbite I felt very comfortable in my SportHill ski suit that with layering underneath is great for almost all conditions. The upload from my Garmin is shown at the bottom and, as can be seen, I lost some time with my first aid stop and I am sure with my slow times at the feed stations. But, as can be seen from the write-up on the inspiration for this blog, there is nothing wrong with auto pausing! This picture is of Tim and I at the finish line on Main Street in Hayward. As you can see it was quite cold! In all the times we have skied the Birkie this was the first time we finished together catching up with each other before Lake Hayward. I have also included three videos from the race. The first is at the midpoint of the race from SkinnySki, the second from 10 Foot Back at the finish, and finally the third the Trailer from the Birkie 2011 Video. 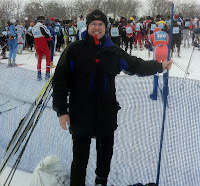 I participated in the City of Lakes Loppet 33K Freestyle Nordic Race in Minneapolis, Minnesota on February 6, 2011. The City of Lakes Loppet is a relatively new event but has grown to be the largest urban Nordic Ski Race in the United States with over 10,000 participants. I met up with some fellow bicyclists, Dave Mathews and Bob Burns from Kansas City, who skied the 25K classic race and who have been coming to the event for three years now. Dave and Bob left early in the Saturday morning from Kansas City and I late in the morning from La Crosse to get to the race in the early afternoon. I interviewed Dave in Episode 10 of the Birkie Web Today Podcast regarding being a skier from an area of the country that does not usually receive a lot of snow and then how you train. The registration experience was well organized in a large tent with a few local and national ski related vendors including Subaru, Swix, Solomon, Bolder Nordic Sport, and Midwest Mountaineering. 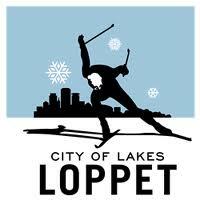 A full listing is on the City of Lakes Loppet Sponsor Page with links. The skijoring 7K, 4.5K, and 2K events were a pure delight to watch on Saturday afternoon. Besides some demos of skijoring at the American Birkebeiner Nordic Ski Race, I had not seen an actual race. In the 7K there were some series racers with well trained sled type dogs and excellent skiers. The 2K was hilarious as many folks just brought their dogs out and not all of them cooperated very well with one skier pushing his dog and a women that used her small Yorkie that you could hardly see bouncing along. The video below does not capture all the fun but is a good recap. I heard from a skier on Sunday that the skijoring events had been the largest ever in the United States and that seem to be confirmed by the wrap-up video above! I had been waiting to finish up this post when the skier pictures were released but I have not seen any as yet, except for the elite skiers. I did have another skier take my picture before my wave got off at the start area which is shown to the left. I had very fast skis but the uphills were fairly beat up which made for some very heavy snow to skate through and many times I just had to herringbone. The course was surprisingly hilly especially at the start and then again about midway through the race. 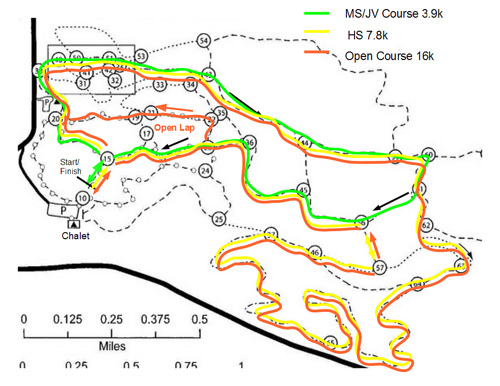 The official map of the 33K course is shown below. Many times it was hard for me to believe that I was in Minneapolis since there were several wooded areas and then going across several very beautiful lakes. Towards the end it was nice seeing the skyline of the city then skiing across I-394 was very interesting seeing the high speed traffic below. There were plenty of super nice volunteers with lots of water and food. As usual I had the energy and water drinks but brought my own gel food which I had at each of the four stops. My official time for the 33K Freestyle race was 3:37:12 so quite slow but, as always, I just love being out in the winter and enjoying the outdoors. Dave had a time of 2:17:46 and Bob 3:07:14 for the 25K. The temperature for the race pretty much stayed around -3 C so it was very comfortable for skiing. My Garmin showed only 31.31K and a faster time. As can be seen below I found a way to embed the map from Garmin Connect which I will incorporate into future posts too. I highly recommend this event as there is something for everyone and very well organized all the way around. I added this photo on February 13th as Dave posted it on his Facebook page. This was a hill that many other skiers fell on so I must have had a smile since I navigated through it! Personalized videos of the race were also released by RaceDay on February 16th where each participant can enter their number and see themselves ski past checkpoints in the race. My personalized video is below. 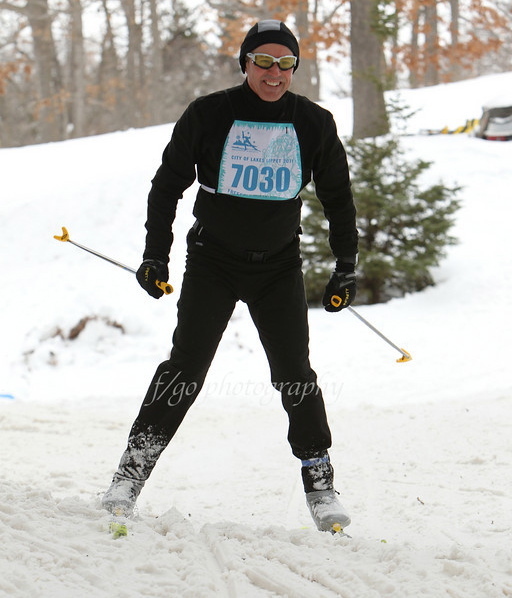 I participated in the St. Mary's 10K Nordic Skate Race yesterday. Pictured with me to the left are Megan and Ryan Ping the winners of the overall Women's and Men's races. Ryan is the brother of Garrett Ping who I skied with at the The Fridtjof Nansen Ski Race on January 16, 2011. 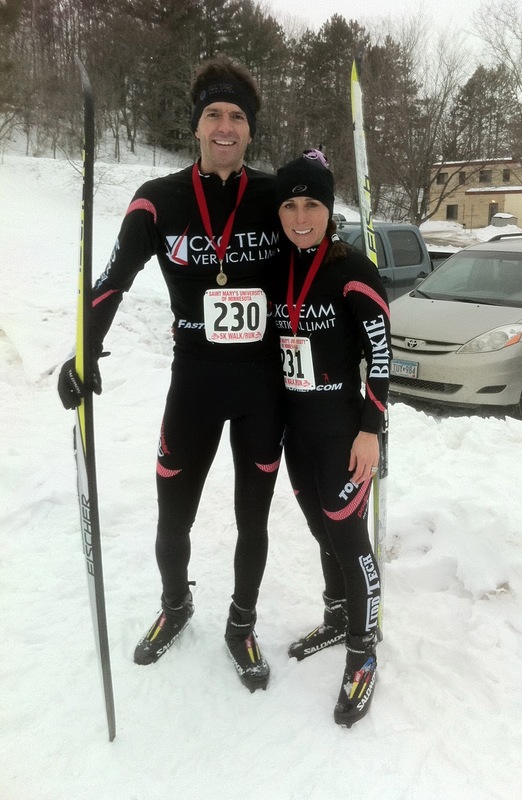 Both Megan and Ryan were members of the CXC Ski Master's Team last year and also have skied the American Birkebeiner seven times. The conditions were great with temperatures around -4 C, a slight wind from the north, and as I have found each time I have skied on the St. Mary's Trails, excellent grooming. A big thanks to Gary Borash the Outdoor Leadership Coordinator at Saint Mary's University for his leadership and organization of the race. As can be seen from the race poster there was also a 10K Classic race held earlier in the day. I had fast skis and felt fortunate as I had not re-waxed them from last week at the Birkie Tour where temperatures were between -20 and -16 C. The reason I had not is because I have been under the weather for the last few days and was not sure if I was going to ski the race until the morning. I still have something going on as I sneezed the whole way back from Winona to La Crosse but felt it was still worth getting outside and enjoying a wonderful Midwest winter day. I am feeling a lot better today as the bug I had was probably moving into the respiratory phase yesterday anyhow or so I rationalize. My Garmin did not record the course as I must not have hit the start button as I thought I had. My official time was 54:58 for the 10K course which was a double loop around the main trails at St. Mary's. To show you how fast the elite skiers are, they were finishing when I was near the turn for the second loop! Garrett was with a group of four that finished very close together and well ahead of the rest of the field. He was 4th overall. Ryan's time was 25:43, Megan's 28:32, and Garrett's 25:51. I still can not get over the beauty of La Crosse and the surrounding areas. The drive up to Winona, Minnesota along the Mississippi is very scenic even on an overcast day like yesterday. I did not have time to take pictures of the many folks who were out enjoying ice fishing. I certainly can understand going out and fishing but not driving my vehicle out on the ice, especially on a river where there can be a strong current underneath. But I am not an ice fishing or even regular fishing expert. Finally, I wanted to provide a picture of the overall winners of the St. Mary's 10K Freestyle Race without the trail sweeper. Congratulations Ryan and Megan! Tim Burke and I participated in the BirkieTour II held on the American Birkebeiner Trail this past Saturday. It was extremely cold with the temperature at -20 C at the start and -16 C at the end so dressing properly and having the right wax were challenges. Both Tim and I were fine with both and then having a nice sunny day helped too! The picture to the left was taken at the Fire Tower Turn Around about 10K into the tour. The course was changed a few days before the tour so instead of starting at Telemark Lodge and ending at either Highway 00 for the short course and Hatchery Park for the long course the tour started at Highway 00. 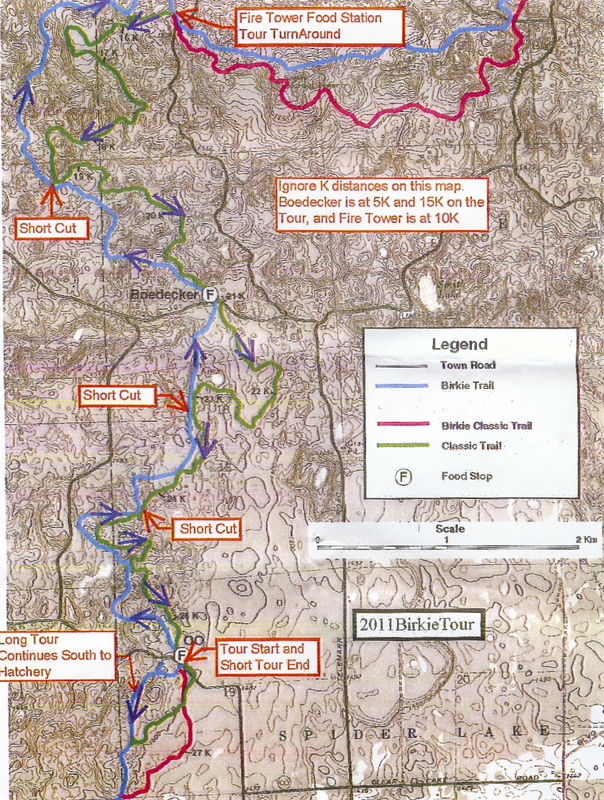 See map at the left of the 20 K short course which went north on the Birkie Trail to Fire Tower Hill, the highest part of the trail, and then turned around and came back to Highway 00 on the new Birkie Classic Trail. The trail was in great shape but because of such cold temperatures the snow was very slow. I had perfectly waxed skis, however, so no complaints except with the change in courses, we were on some of the highest hills of the entire Birkie Trail the entire time. I had wanted to go on and do the longer 42 K but with the cold was feeling the start of some frostbite on my face and then both of our toes were getting very cold too! 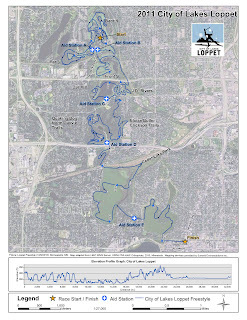 The map and stats for the tour are found at my Garmin which showed the course at 19.5 K. Since this was a tour and not a race we stopped often to take in the beauty of the trail and especially the Classic Trail which we don't get to ski on very often. Total time was 2:18:09. Over 640 skiers pre-registered for this second annual event and with the cold temperatures the American Birkebeiner Ski Foundation was afraid it would keep people away. Instead there were 50 new registrations on Friday night and Saturday morning. The foundation also reported that skiers from as far away as Tennessee, Florida, Texas, and California in the United States and from Scotland, Russia and Canada participated in the event. While that seems like a lot of skiers for a race it was much smaller than the American Birkebeiner race in February which attracts over 9,000 skiers for the various events. 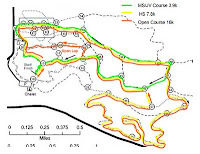 What both Tim and I liked is that with the many up and downhills the course was not skied in with ruts that usually happen in the Birkie Race due to so many skiers. Tim is pictured to the left at the Fire Tower turnaround. I wanted to take more pictures but my hands got way too cold and it took me 2-3 K to get the feeling back in my finger tips. After the tour Tim and I drove into Cable, Wisconsin and ate a late lunch / early dinner at The Rivers Eatery which is located in The Ideal Market. Garrett Ping, who I skied with last weekend in Eau Claire recommended the restaurant and this will be sure to become a regular place for Birkie week too. Wonderful stone oven pizza, salad, and plenty of good micro craft beer on tap all in a very nice atmosphere. After lunch we visited John Kotar and his family at his cabin in Cable. 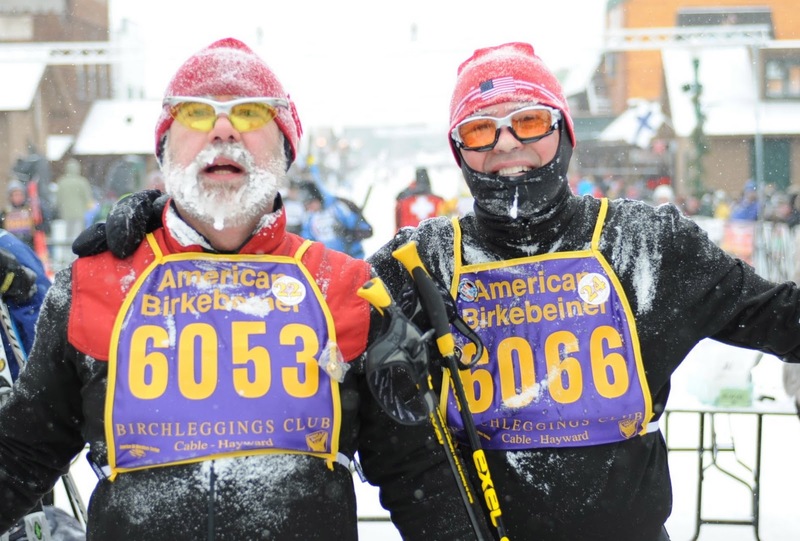 John is the founder of the Birchleggings Club and is a member of the American Birkebeiner Ski Foundation Board of Directors. He did not participate in the BirkieTour but did get out for a couple of hours of skiing in the early afternoon because of the cold. We stayed at the Lenroot Lodge in Seeley, Wisconsin and with the change in the BirkieTour couse we were very close to the start on Highway Double 00. The lodge is owned by the same folks as the Sawmill Saloon, which is a mainstay of Seeley and a restaurant we have eaten at every year that we have been up for the American Birkebeiner ski race. The Lenroot has very reasonable rates with nice rooms with a loft. My only complaint is that the temperature could not be controlled so it was quite warm in the room. 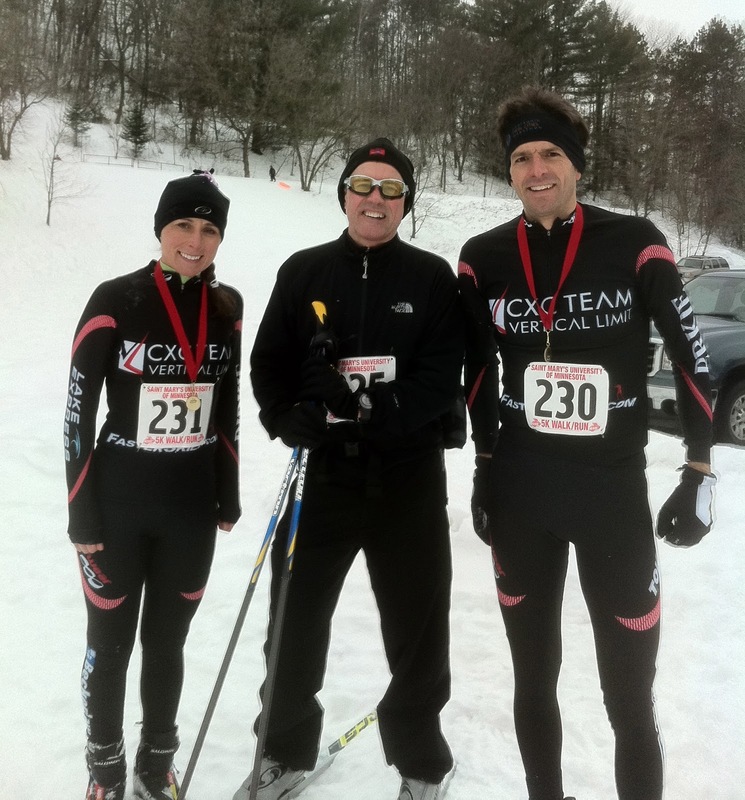 All in all a great weekend with a one of my Birkie Buddies! Tim will be meeting Mike Tarnow, our other Birkie Buddy, next weekend at the Noqueman Ski Marathon in Marquette, Michigan. Too far for me to drive from La Crosse, Wisconsin. 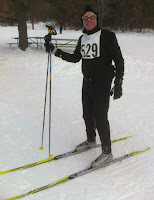 Yesterday I participated in The Fridtjof Nansen Ski Race at the Tower Ridge Ski Trails north of Eau Claire, Wisconsin. It was a cold, clear, and crisp day with the temperature at the start at -14C and only warming up to -11C. The Tower Ridge Ski Trails are very well maintained, wide, and perfect for skate skiing for both beginners and advanced skiers. In fact there were junior and kids races as the trails only have a few steep hills with mostly flat and rolling terrain. All are very scenic though the woods. The picture to the left was taken just after I finished the race near the wonderful warming chalet that is located at the trails too. I was curious about the name of the race and after only getting bits of information on the website and through asking people I did some research and found information at the Nobel Peace Prize website which I use here. The race is named after Fridtjof Nansen who was a Norwegian that was born in Oslo in 1861. Growing up he became expert in skating, tumbling, and swimming, but it was his expertise in skiing that was to play such a large role in his life. In school Nansen excelled in the sciences and in drawing and, upon entering the University of Oslo in 1881, decided to major in zoology. In the next fifteen years he united his athletic ability, his scientific interests, his yearning for adventure, and even his talent for drawing in a series of brilliant achievements that brought him international fame. For a long time Nansen had been evolving a plan to cross Greenland, whose interior had never been explored. He decided to cross from the uninhabited east to the inhabited west. The party of six survived temperatures of -45° C, climbed to 9,000 feet above sea level, mastered dangerous ice, exhaustion, and privation to emerge on the west coast early in October of 1888 after a trip of about two months, bringing with them important information about the interior. 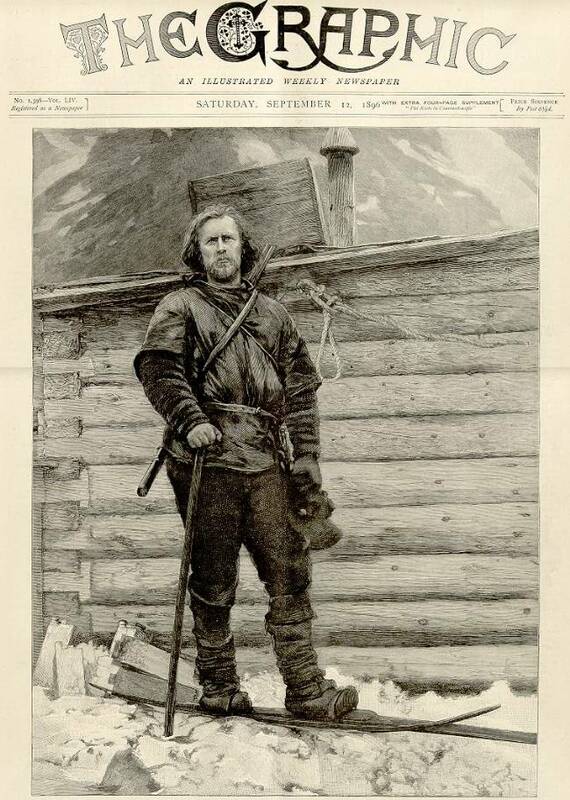 Additionally, Nansen and one companion, with thirty days' rations for twenty-eight dogs, three sledges, two kayaks, and a hundred days' rations for themselves, had set out in March of 1895 on a 400-mile dash to the North Pole. In twenty-three days they traveled 140 miles over oceans of tumbled ice, getting closer to the Pole than anyone had previously been. Nansen went on to work on several humanitarian projects including working with prisoners of war after WWI, directing relief for millions of Russians dying in the famine of 1921-1922, repatriating refugees from Greece and Turkey for the League of Nations, and in assisting to save the Armenian people from extinction. He received the Nobel Peace Prize in 1922 and died in 1930. I drove up to the race with Garrett Ping who is a Chiropractor from Winona, Minnesota. Garrett is an elite skier who has done several American Birkebeiner and other regional ski races. He is also a road cyclist which is where I got to know him, through a post he had made on the listserv that he was going up to the race. Garrett had never done the Fridtjof Nansen Ski Race either. He is pictured to the left in red with Brant Wesolek. Garrett came in second place overall with a time of 43:38.7 or only 4 tenths of a second behind Brant. Garrett and Brant's best placement overall in the Birkie is 99th and 45th respectively. My time was quite a bit behind the leaders but, like all the races I do, my main purpose is to have fun and just ski! I had waxed a bit warm so my skis were sluggish but when things don't work out just right I just take in the beautiful scenery, work on technique, and be thankful that I am enjoying such a beautiful winter day in Wisconsin! The race was advertised at 15.6 K but we were told that it was just over 14 K at the beginning of the race because of grooming in one of the areas. My Garmin showed 14.69 K and my time was 1:26:18. The map of the race is to the left. Over the New Year's weekend we had a warm-up in the Midwest with rain and temperatures sometimes reaching into the 40's. While we did not loose all of our snow it turned it very hard once the temperatures went back below freezing which made it difficult for skiing. We have had a few more inches of snow but the skiing in La Crosse is still a bit challenging. 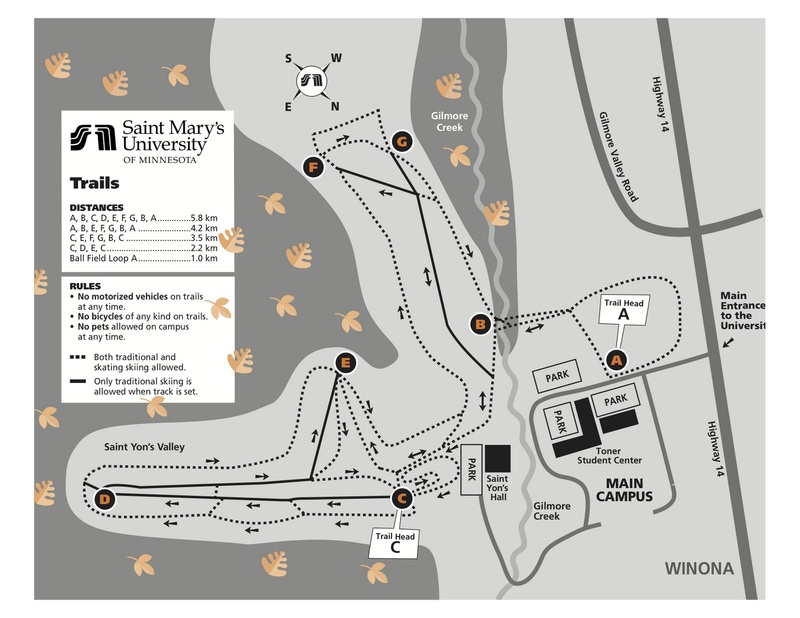 Saint Mary's University in Winona, however, has excellent grooming equipment and trails that are dedicated to skiing so they are not trampled over like the Hixon Forest trails. This is quite a challenge to the volunteer Hixon Groomers here as there are a lot of walkers and snowshoeing. The picture to the left is of St. Mary's in the distance taken from one of the trails. 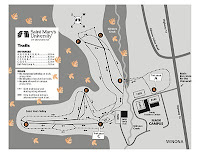 I was able to download the trail map off the St. Mary's website. 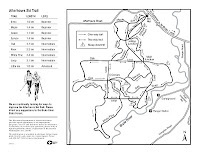 There are 16.7 kilometers of trails and what the map does not show is the elevation which is very nice as the trails are in the bluffs along the western side of the Mississippi River. My Garmin map provides a much better map of the elevation. My total distance was 14.62K. It was not my best day today as I thought I was coming down with some type of stomach aliment last night but felt better in the morning. I was very slow at first but picked up as I went along. Also I had waxed for the high temperature of about -9 C but it did not warm up until much later. When I started it was -14 C so I can use the excuse of my wax not being quite right too! The picture to the left is of a nice wide section of the trail that has double tracks for classic and a nice wide area for skating. Most of the trail system is single tracked with a skate lane but all of the trails are well groomed and taken care of which, with the hills, makes this a great spot to go for Birkie Training. St. Mary's asks for a $2.00 donation which is very reasonable given the condition of the trail system. The inspiration for this blog comes from my former partner with the Kansas Cyclist Podcast, Randy Rasa. Randy has a really unique perspective when it comes to bicycling in that he likes to do what he calls Ramble Rides. He puts together routes, whether on the road, gravel, or a trail, not just for how long or how fast you can go but taking the time to stop at historical landmarks and studying the history of an area. In Kansas there is a very rich history, especially during slavery times, where so many fought to make Kansas a Free State. The Santa Fe, California, and Oregon Trails also came through this area and are marked in several locations. On April 11, 2010 I went out for a ride and biked on parts of some routes that I put together for the Quivira Park Bike Group. This was a ride that I used to lead on Saturday mornings from May through October when I lived in Overland Park, Kansas. Instead of riding right by things I stopped and took some pictures. I also changed some of the small bags I have on my racing bike so I can always have a camera handy to snap shots. 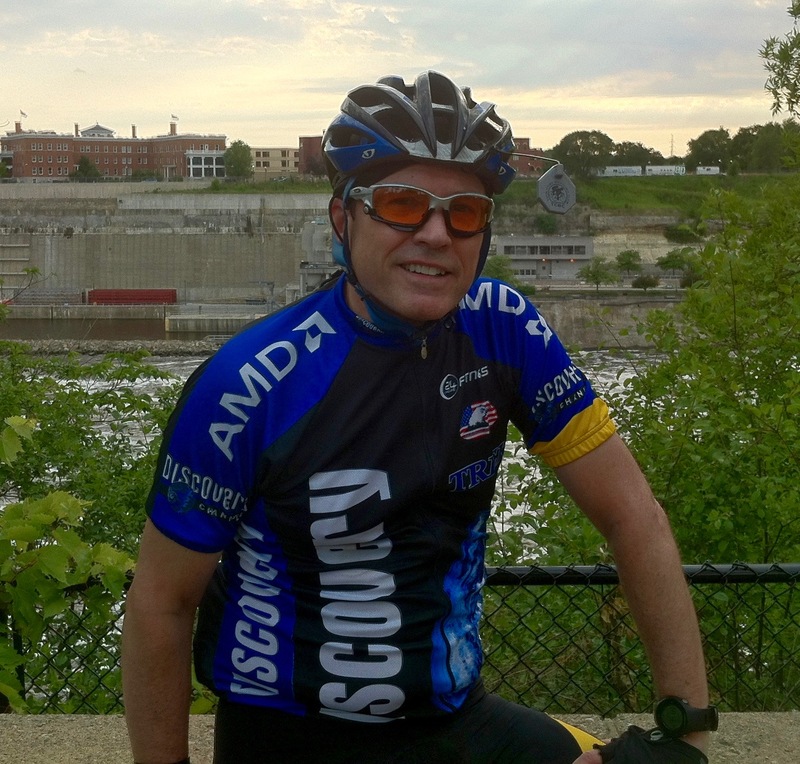 I thought of the name for this blog during the ride, as "Edwards's Life Trek" because it has a double meaning, in that I own a Trek bike and there is much more to a ride than just cycling! I resolved to myself that it is okay to work on speed, technique, and doing hills, but I can put my Garmin on "Auto Pause" and truly stop to see and learn about things rather than just speeding right by. I think we all need to "Auto Pause" our life more often and hopefully this blog can help me do that.